I was wearing the Flip Belt again this weekend and someone asked me, “Do you REALLY like the Flip Belt or did you just say that?”. It surprised me. Sometimes I forget that some of my readers don’t know me personally. Don’t know how I feel about things. Don’t know how I feel about this blog. Don’t know how I feel about honesty. So, for the record, you probably won’t hear about the things I don’t like unless it’s a really big deal ….. like a race that we all paid a lot of money for and then got the short end of the stick. I don’t want to throw a lot of negativity out there because there is truly something for everyone and just because it doesn’t work for me, doesn’t mean that it won’t work for you. However, if I tell you about it, then I like it. In fact, I really like it. If I don’t tell you about it, then well, I have other things I like better. On a similar note, the way I work the giveaways, is I normally go after products, for you, that I already own and like. So I don’t have to worry about getting something for free, reviewing it, and then having to write about it if I don’t like it. There are a few exceptions to this rule, the Flip Belt and the Yurbuds Inspire for Women headphones (Review HERE) are both products that I went after that I didn’t already own. I took a chance because of the wonderful things that other people, who I knew personally, had already said about them. It worked out very well both times. I now own 3 pair of the Yurbuds Inspires (green, yellow & pink) and I have ordered two additional Flip Belts (pink & black, in addition the yellow they gave me). Now you know. If I say I like it, I really do like it. In fact, I probably love it. Now back to the Flip Belt that I LOVE! So far I’ve used it on every outdoor run since it came in the mail. Runs as short as 4 miles and as long as 20. It works great for me. Doesn’t bounce. Doesn’t move. Holds lots of stuff. It even holds my shirt down if it’s cold. Bonus! I looked at the sizing chart (below) and was between sizes. I’m an 8-10 in pants. I ordered the large because I like things to ride on my hips and not my stomach. It was the right size for me. The Flip Belt Winner is #117, Stacy Kirk. Congratulations, Stacy! Please contact me at amanda@tootallfritz.com. 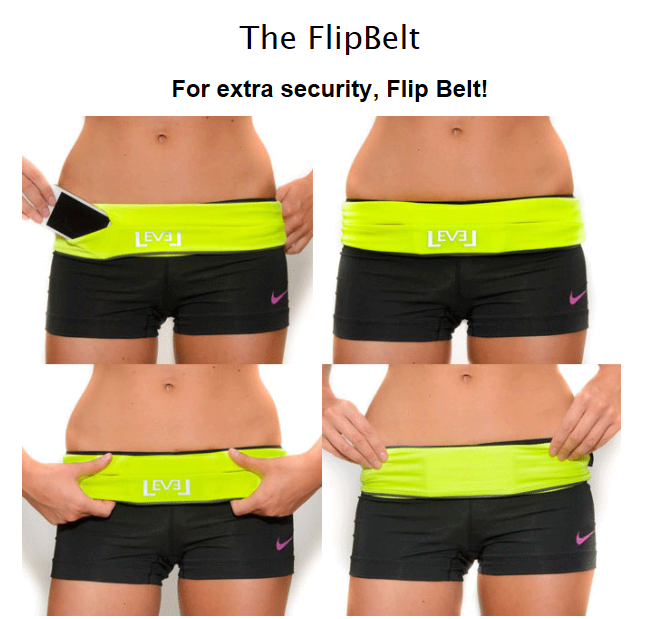 I need your email address to send to Flip Belt so they can set up an account for you! For the rest of us, Flip Belt set up a 15% discount code: tootallfritz. Feel free to use the code and share it with your friends if you like. It’s active now. I’ve already placed an order using it. The code expires on April 25, 2013. This entry was posted in Giveaways, Product Reviews, Running and tagged best fitness belt, fitness belt, Flip Belt, Flip Belt Giveaway, Flip Belt Giveaway Winner, no bounce fitness belt by tootallfritz. Bookmark the permalink. I’m SUPER picky so just “don’t respond” to most offers. I don’t envy you. Good luck! whew….I know that wasn’t me who asked that!!! I did ask if you were wearing your flipbelt……but I did not ask the rest of the question!!!! I assume if you are writing about it/raving about it, you really like it…. No worries, Lynn. No it wasn’t your question but certainly got me thinking. Honesty is important to me but I guess everyone doesn’t know that because they don’t know me personally. It was a good question and I’m glad they asked. Just wanted to say thanks for the note on sizing…I’ve looked through about 15 Flip Belt reviews and yours is the first to mention how your actual pants size relates to their size chart and whether it is the right Flip Belt size. Crucial part of a review 🙂 (Most reviews– if they even mention sizing– say something like, “I ordered a medium and it fits great!” — not helpful). Thanks again.